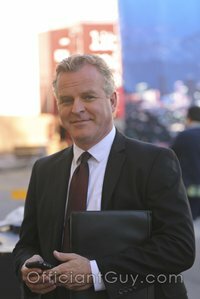 I have been a Los Angeles County wedding minister for many years, and I have officiated weddings of all kinds, including civil wedding ceremonies and religious wedding ceremonies, all over Los Angeles County and Orange County in many Alhambra Wedding Locations. Consider the Almansor Court, a wonderful Southern California wedding venue that you might consider for your wedding. Or if you are interested in a more casual wedding, give me a call and we can discuss the many options for your wedding location. As a very experienced wedding minister, I can highly recommend Almansor Court as your wedding venue. Almansor Court is situated along Beautiful Lake Alhambra and The Alhambra Golf Course. The Lakeside Gazebo is the perfect setting for wedding ceremonies and outdoor cocktail wedding receptions. Facilities can accommodate up to 1000 guests for a wedding cocktail reception and 600 for a seated wedding banquet. You may have some visiting ducks during your ceremony. Several of the many ballrooms offer lush landscape views of the golf course and Lake Alhambra. The Lake View, Palm Court, and Greenhouse Rooms all have spectacular views. 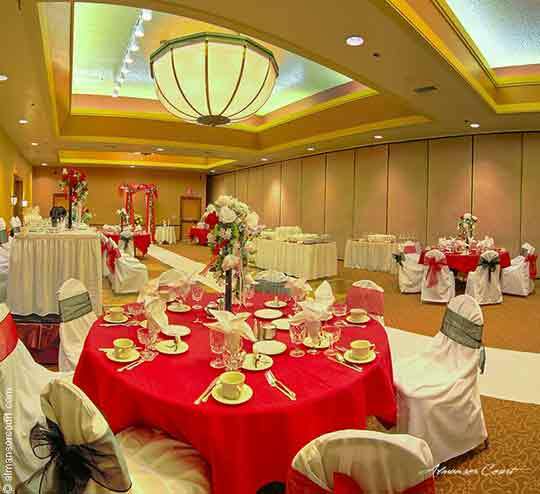 Each ballroom is richly-decorated with your comfort in mind. The Almansor Court catering staff is dedicated to personalized service. Their event planning professionals will help make your special event both successful and a culinary delight. As your wedding minister, I would offer my own service and professional attention. 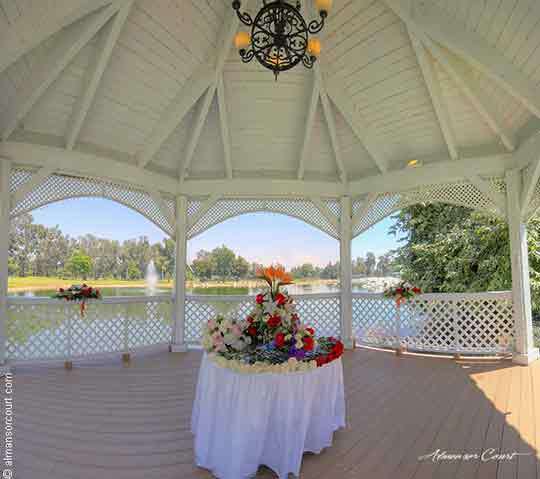 The most charming aspect of Almansor Court is the lovely gazebo by the lake. There is nothing more romantic than a lakeside wedding ceremony. Every bride wants her wedding to be unique and unforgettable. But finding a place to have a lakeside wedding ceremony in Los Angeles can be tricky. Almansor Court offers that opportunity at a very reasonable price. If you are thinking of having your wedding ceremony or reception in Los Angeles County or Orange County, California I can highly recommend Almansor Court. 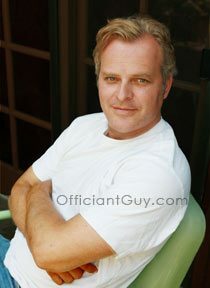 Please consider having the Officiant Guy as your wedding minister.